"By giving us this prize, the Norwegian Nobel Committee has given important support to the proposition that peace is inextricably linked to poverty. Poverty is a threat to peace. The world's income distribution gives a very telling story. 94% percent of the world income goes to 40% of the population while 60% of people live on only 6% of world income. Half of the world population lives on two dollars a day. Over one billion people live on less than a dollar a day. This is no formula for peace." And I can say by what I witnessed in his work, that the struggle of those who truly are the poorest of the poor, they suffer from so many things that we can't even imagine having to deal with in the 21st century. Shahnaj is a great example of the tragedy they face. Her son died from stepping on a chicken bone during the floods. He got tetanus and didn't find out in time. They also had a roof full of holes, so when it rains everything get soaked and their floor turns to mud. They live in a single room with the goats in the kitchen during the storm. That people have to endure these conditions when the rest of the world has so much is a real tragedy and lack of balance in income distribution. JB: Microlending flies in the face of conventional economic theory, doesn't it? HM: It's funny. When Yunus started, everyone thought he was crazy, because it hadn't been done. They all assumed that the poor wouldn't pay back because they don't have money. Banks only lent to people who had collateral. 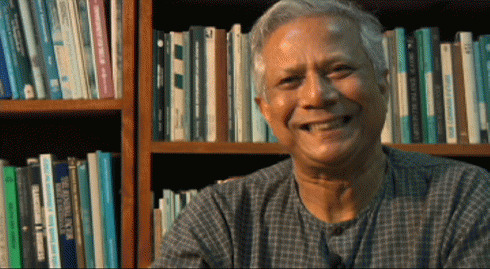 But what Yunus saw was the opposite; in fact, the poor worked really hard so that they could pay back their loan. He just made the loan manageable by collecting small amounts each week, so that a big loan wasn't hanging over their heads to be paid off all at once. Now, a lot of other groups see the potential for microcredit, but nowadays you have to be careful about what their motive is, and if they are running it in a way that really will benefit the poor. Some of them have gone public and that's where I think they derail and stop putting what's best for the poor first. There have been some serious abuses that need to be regulated within microcredit. But I think this will happen with any business idea; there is always room for abuse. Other Series: View All 3 Articles in "Yunus"